The much loved story of Cinderella is reset in 1830’s Upper Canada, just as “Muddy” York is to be renamed Toronto, and where the very Canadian Cinderella is expected to cater to every whim of her recently immigrated stepmother and sisters. True to the classic fairy tale, with a little magic and some imaginative special effects our resourceful girl does get herself to the Ball, and to the satisfying conclusion of the play. The performance is ingeniously staged with a traditional marionette theatre that transforms as the story unfolds into scenes evoking the wilderness, pioneer life and early Canadian society. 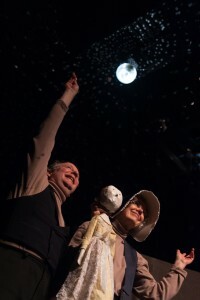 Cinderella in Muddy York is a whimsical but informative take on Toronto history that tickles the funny bones of children and adults alike.